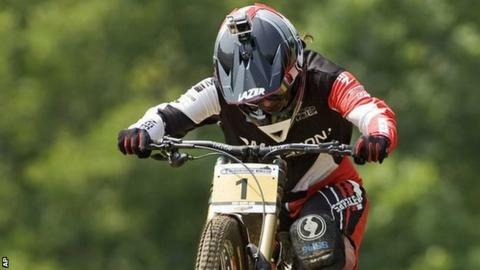 Manon Carpenter is hoping for a first Mountain Bike World Cup Downhill Series win of 2015 at this weekend's fifth round in Mont-Sainte-Anne, Canada. The Welsh rider, 22, won the World Cup and the World Championship in 2014. Crashes and a disqualification have all but put her out of the title race this year, but a second place in the last round in Lenzerheide, Switzerland, indicated her form is improving. "It's been up and down, and I'm hoping it's on the up now," Carpenter said. "Not really the results I'd hoped from the first three races anyway, although the last World Cup race I got a second. "That was the first race I felt like I'd had a good day on race day. It's been frustrating as I know what I can do, but it's hard to put everything together to get it right on race day. "With those results and after you've had a crash there's quite a lot of work to build your confidence back up again. "But hopefully I'm getting back to where I'd like to be." Carpenter won in Mont-Sainte-Anne last year and the 2.9km track is again to her liking, with qualification on Friday and the race itself on Sunday. "It's running well, it's one of the fastest tracks on the circuit and it's really dry here so it's pretty loose - it is good fun," she told BBC Radio Wales Sport. "I've always got on well with this track - it's long and that kind of plays to my strengths, it is the kind of track that suits me so it's nice to come back." Rachel Atherton leads the women's series after three consecutive victories, with 910 points to Emmeline Ragot's 745. Although Carpenter has previously admitted that the title is realistically beyond her, she is just 26 points behind Australia's Tracey Hannah (550 points) in third place and an overall medal in the World Cup is still within reach. But the Welsh rider admits her main aim now is to build towards the World Championships in Vallnord, Andorra, on 24-27 August. "It's quite nice to know that at the end of the season there's still the World Championships," she added. "It's a one-off, all or nothing, it doesn't really matter what's happened the rest of the year so I'm looking forward to that one."